Gov. Bruce Rauner today declared a harvest emergency to help level the playing field between Illinois farmers and crop haulers and those in neighboring states. We have heard from Illinois trucking industry and from farmers who are operating on thin profit margins in todays agricultural climate, Rauner said before making his announcement at the Ladage Farm in Auburn. Todays harvest emergency declaration recognizes that the weight-restriction structure in place in Illinois put our farmers and truckers at a disadvantage. They cannot and should not be forced to wait until the 2019 harvest season to reap the economic benefits of eased weight limits, he said. Now they wont have to as they take their crops to market, processing or storage. We appreciate Gov. Rauner declaring an emergency situation for the 2018 harvest season, especially in light of the declining incomes and market turmoil which farmers are currently facing, said Richard Guebert Jr., president, Illinois Farm Bureau. This declaration opens the door for increased efficiencies for farmers and truck drivers hauling agricultural commodities and will help offset any uncontrollable effects of weather and commodity markets, allowing farmers the freedom to move what is projected to be a record-breaking crop. Permits will once again be issued at no charge, but applicants must obtain a route authorization number every two weeks. The harvest emergency permit and other information on the permitting process can be obtained through IDOTs automated permitting web application here. Rauner said the declaration will speed the movement of crops to market, adding that the importance of an economically healthy agriculture community in Illinois cannot be overstated. Illinois is home to 71,000 farms on 26.6 million acres. Marketing of Illinois agricultural commodities generates more than $19 billion annually, and the states food and fiber industries employ nearly 1 million people. The state ranks third nationally in the export of agricultural commodities, with $8.2 billion worth of goods shipped to other countries, according to the Illinois Department of Agriculture. Our farmers feed the world, working tirelessly every harvest season to get their crops from the field to market as quickly as possible, said Illinois Department of Agriculture (IDOA) Director Raymond Poe. We need to give Illinois farm families every advantage we can to ensure they stay competitive with farmers in neighboring states. We thank Gov. Rauner for recognizing the need for a quick change to help our farmers this harvest season without waiting until the new law takes effect next year. Gov. Rauner and Director of Agriculture Poe are enabling farmers a smoother, more efficient harvesting season, given the weather, said Rep. Avery Bourne, R-Raymond, who attended todays ceremony. I supported the governor last year with this announcement, and I stand with him today to ensure Illinois does its best to help this pillar of our economy the agriculture industry. 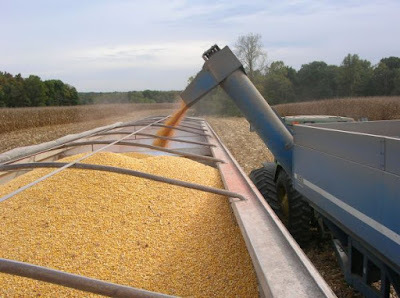 I applaud this decision to allow trucks hauling agricultural commodities to obtain a free permit to exceed the gross vehicle weight limit by 10 percent and help farmers harvest their crops more efficiently, said Severin, a member of the Agriculture and Conservation Committee. Im glad to see that our state is taking the steps necessary to assist our agricultural industry at a critical time of the year, added Rep. Jerry Costello II, D-Smithton. With livelihoods at stake, we need to responsibly remove barriers for our harvesters and ensure that their crop is brought to market. I am appreciative of the effort on both sides of the aisle to make this emergency order a reality. Im encouraged to see Gov. Rauner be proactive about an issue that has unfairly restricted our farmers and hindered our states ability to compete with our neighbors, said Sen. Dale Fowler, R-Harrisburg. This decision to declare a harvest emergency will serve as a bridge until House Bill 5749 takes effect next year, providing relief to those in the agriculture industry and providing some long-term assistance to Illinois farmers. I support the harvest emergency declaration because our farmers need every opportunity they can get to get their crops out of their fields as quickly and efficiently as possible, said Sen. Paul Schimpf, R-Waterloo. A declaration such as this shows we value their hard work. Giving farmers additional latitude to harvest crops this year will ease their burden and allow for commodities to get to the market quicker, which is good for all consumers, said Sen. Neil Anderson, R-Andalusia. Agriculture is the backbone of Illinois economy, so anytime we can support farmers and the agriculture industry, its a win for the entire state. I wish our farmers a safe and bountiful harvest. Harvest season always comes with unexpected delays and unpredictable challenges, said Sen. Jil Tracy, R-Quincy. This declaration should pave the way for a smoother harvest season for the farmers who feed our world. With this harvest emergency declaration, farmers have the ability to get more grain to the storage sites quicker. I appreciate Gov. Rauners action and IDOT for developing a user-friendly application process, said Rep. Dan Swanson, R-Alpha, a fifth-generation family farmer and member of the House Agriculture and Conservation Committee. Its that time of year when farmers have to harvest their crops with limited time, said Rep. Charlie Meier, R-Okawville. The governors declaration will be very helpful to farmers as it can be difficult to estimate the proper amount of bushels loaded on a semi. Without this declaration, if a semi is determined to be overloaded, the fine can actually be worth more than the crop itself. Im glad the governor declared the harvest emergency in order to help Illinois No. 1 industry, agriculture. Moving corn and other crops in a timely and efficient manner affects the bottom line of hard-working farmers, said Rep. Terri Bryant, R-Murphysboro. This declaration is an appropriate response to an urgent need and I applaud the governor for taking this action.